The Red Arrows are renowned throughout the world as ambassadors for both the Royal Air Force and the United Kingdom. Since the Team was officially formed in 1965, the Red Arrows have completed over 4,000 displays in 53 countries. S&D Simulation are proud to operate The Red Arrows Simulator which was specially commissioned in support of the Red Arrows Charitable Trust. 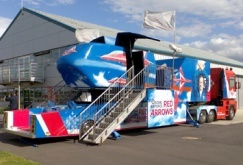 The Red Arrows simulator can be seen in attendance at all the major air shows and military events throughout the UK. Ride in one of the Hawk Aircraft with Wing Commander 'Red 1' in one of the fantastic displays. Formula 1 racing experiences have been available in the simulator world for many years, but only ever as a choice of experience alongside others. This gave the Renault Formula One Team management the inspiration to take this a step further and commission a simulator specifically in support of their team. Utilising one of our ultra-modern Morphis simulators, we have created an immersive Renault F1 Team experience where you can ride around the legendary Barcelona track, Circuit de Catalunya. The simulator is fully branded with the corporate sponsors, being instantly recognisable as Renault F1. We even have a Renault Magnum tractor unit to transport the simulator, this being branded in the same way as those which are used to transport the actual race cars from one Grand Prix to another. As well as attending the European Grand PrixÃ¢? ?s where the simulator is of course enjoyed by F1 racing fans, it attends many other motor sport events throughout the UK & Europe where it is popular with the public at large. When not operational elsewhere, the Renault F1 Team Simulator can also be hired to attend any form of corporate or private event. Our latest project for AstraZeneca, the 'atheropod' simulator demonstrated the cause and effect of atherosclerosis where the rider was taken on a cardiovascular voyage through the arteries. This is an example of a simulators use as a communication tool where we can provide a full service package to include concept development from artistic conception to integral design. We can create custom experience content, using either computer animated or real filmed images or a combination of both, in order that the desired effect in your message, advertisement or corporate image can be achieved. We can externally brand the simulator as required. 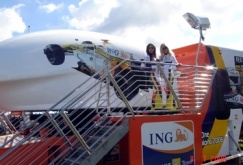 We then operate the simulator on your behalf wherever required, with the events attended chosen to match your target demographics, guaranteeing high visibility with the most appropriate audiences. 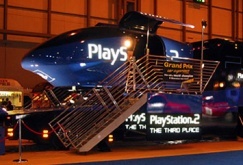 For a longer term campaign, you could consider sponsoring one of our simulators such as Sony did for the launch of the PlayStation & PlayStation 2 consoles. This would involve us attending a selection of our usual high-profile public shows & events which are chosen with a view to targeting your key demographic. The general public then pay individually to ride the simulator which either shows one of our library experiences such as a rollercoaster ride or a bespoke experience which you have commissioned. The revenue drawn from the public is then used to subsidising the overall cost of the campaign. 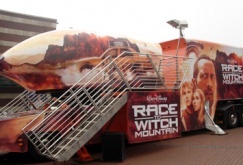 S&D Simulation were chosen to promote the European launch of Walt Disney Studios Race to Witch Mountain feature film. The use of simulation was deemed a key component of the promotional plan from the outset - a bespoke simulation experience was created starring actors from the feature. 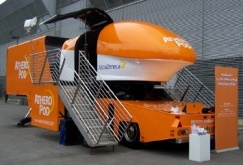 Our simulator was fully wrapped effectively becoming a mobile billboard for the film and was toured around Europe visiting major cities to coincide with the release dates in each country. The Battle of Britain Memorial Flight is the RAF's tribute to the aviators of WWII, and flies several Spitfires, two Hurricanes, a Dakota and a Lancaster. The BBMF aircraft are regularly seen in formation flight at air displays throughout the United Kingdom and Europe, at events commemorating World War II and upon British State occasions, notably the Trooping the Colour celebrating Queen Elizabeth II's 80th birthday in 2006. In the years immediately following World War II it became traditional for a Spitfire and Hurricane to lead the Victory Day flypast over London. From that event there grew the idea to form a historic collection of flyable aircraft, initially to commemorate the RAF's major battle honour, The Battle of Britain, and latterly with broadened scope, to commemorate the RAF's involvement in all the campaigns of World War II. As operators of the official Red Arrows simulator ride, S&D Simulation was commissioned by the RAF to create a similar experience for the Battle of Britain Memorial Flight. The official BBMF simulator ride offers a breathtaking flight onboard a spitfire aircraft. This simulator attends the major UK air displays and we are seeking further events to attend, particularly those which celebrate British heritage or commemorate World War II. 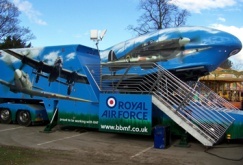 The official BBMF Simulator attending your event, on either a commercial or non-commercial basis.